About a year after my original company Baker Guitars closed its doors in 2003, I launched Fine Tuned Instruments in 2004 as a single man shop and slowly put together each department. It grew from a single man business to a small crew of five delivering the b3 guitar line to the world in limited quantity, not taking any dealer orders and just delivering what I was able to make with the materials I would source. This approach worked well for about four years, allowing the shop to grow slowly, giving me time to design and tool up for a nice assortment of five various models covering solid to hollow-body guitars at various boutique price points through a minimal dealer network until the economy took a turn for the worse. Almost overnight, we scaled back to mainly the core two guys, myself and a long-time jack-of-all-guitar-trades. Having built up a small dealer network and distribution in Japan with zero advertising plus the fan base of the original Baker Guitars, we had re-established a quality reputation yet again found ourselves at the crossroads and needed to make a plan. At that time, Cliff Cultreri at Destroy All Guitars was my primary business consultant and investor. He has a knack for hand picking quality music industry talent from the likes of Steve Vai and Satriani to Reinhold Bogner, Top Hat amps and for others, he has donated his godfather-like wisdom with a pay-it-forward approach. He is a true patron to the arts, from simple counseling to financial backing. Cultreri is a tone consultant for customers worldwide, and many of his customers are well off businessmen with a sweet tooth for guitars and amps. When the economy did a spiral nose dive in 2008-2009, I knew I had to make a change to save the brand and our jobs, so Cultreri and I had a chat about “what if.” I expressed my interest in an sole investor with attorney skills, business management, passion for guitars and someone who would NOT be a silent investor. I wanted a primary owner who would truly drive and guide our ship to success. After a short chat, he said I know of two guys, but one in particular I believe is the best for this venture. Within a few days, we had a three-way chat with Michael Berstein, Cultreri and me, and a week later, Berstein flew out for a business overview and met with a few key people including my long time Baker Guitars partner Gil Vasquez and sales rep Jimmy Lovinggood, plus Berstein’s long-time friend Howard Swimmer. Under the Fine Tuned Instruments roof, I was already building products for other brand designers who wanted to use my name to help optimize the build quality of their designs. In doing this, I was used to working with other designers and reverse engineering their models, which allowed them to move out of a pencil drafting world and into computer aided drafting and generating computer numeric control programs for repetitive production of the model. This allowed me to ride through the rough months doing consulting to CAD development for various companies. One month after our first meeting, a group of people flew to Pittsburgh for a meeting-of-the-minds summit to see if a small group of brand designers could come together with a plan to form a builder’s guild. For three days we delivered round-table idea presentations and brainstormed about Berstein’s initial vision to build legendary brands by giving builders the infrastructure required for them to focus on their skill verses the business aspect. Could these boutique industry underdogs give larger-known brands a true run for their money in a down economy and remain successful in the long run? Only time would tell, but we were off to a very positive start. In the original meeting, we met with Jason Schroeder of Schroeder Guitars, Saul Koll of Koll Guitars, Dennis Fano of Fano Guitars, Mark Bartel of Tone-King Amplifiers plus a group of well-versed industry musicians to financial advisers: Cliff Cultreri, Matte Henderson, Lance Keltner, Jimmy Lovinggood, Howard Swimmer, Steve Harplen and more. After three days of getting to know each other, we left energized with an idea and a handshake intent to be followed up with contracts for each interested party. So it was written, so it was done. The Premier Builders Guild formed on November 17, 2009. There was a very interesting dynamic between Berstein, Swimmer, Lovinggood and me, all being the same age, all having been friends since second grade, having a passion for live music. There was a mutual connection that was very comfortable out of the gate. With me as the beginning building block, the company began with the addition of Fano of Fano Guitars, Koll of Koll Guitars, Johan Gustavsson of JG Guitars, Roger Giffin of Giffin Guitars, Schroeder of Schroeder Guitars as guitar brands, most of whom I was already close with or had a good reputation with. Bartel of Tone King Amplifiers and Robert Gjika of Gjika amplifiers rounded out a boutique gear package. To begin, the plan was to identify departments of excellence and use one sales force, one accounting department, one marketing branding firm, so we could consolidate a lot of work into fewer departments. Immediately, I had to evaluate our production facility, and the choice was pretty obvious. 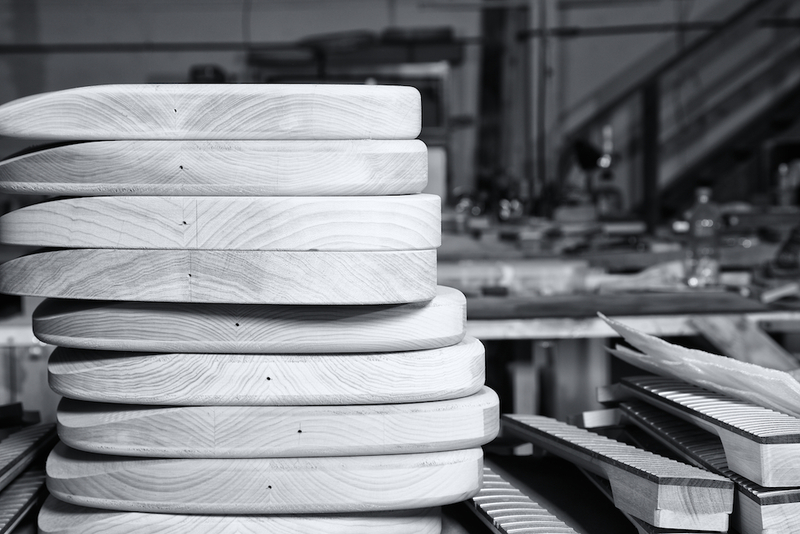 We needed to move into a larger facility with the right space and layout to produce guitars. Luckily, we located a 7,000-square-foot shop only a half mile up the street that was perfect for a guitar shop. It had a separate paint shop that was once an auto-body-restoration business. We moved in April 1st and added some key crew members, set up shop and by July 2010, we started delivering guitars to dealers throughout the U.S. and Japan. I recruited the aid of a long-time friend and CAD guy Larry Juarez to take on the challenge of getting six guitar brands with multiple models per brand reversed engineered, tooled up, prototyped, designer approved and into production. Within that first year, we delivered 27 different models to the January 2011 Anaheim NAMM Show and had a small showing at the 2010 summer Nashville show. Montrose with MGB at Mongos in October 2010. Premier Guitar Magazine Factory Tour in 2010. Any plan or business must quickly change and react to what it learns on a daily basis to survive. I learned always to expect change and to constantly look for ways to improve speed and quality in how we do our daily job. The first three years were rough, and we earned a lot about what we could or could not do, who our customers were. Not all brands remained; we lost a few for a variety of reasons, and all remain very good friends. We’ve encountered many growing pains, as all businesses do, but everyone has been able to put his or her personal agendas aside to focus on what is best for the company. Recently, we added the expertise of Brian Swerdfeger as the president of the Premier Builders Guild. 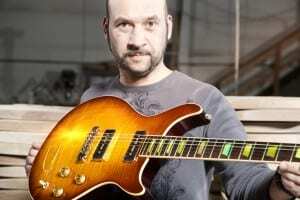 He was the general manager for Taylor Guitars for seven years and was a ground floor guy for the start up of Line 6. Swerdfeger comes in with a wealth of industry knowledge as a long-time professional guitar player and a guy who just loves gear and works very well with people. He has identified what our products are, who they cater to and has a strong knowledge of guitar production. He has become the quarterback that helps challenge and organize the team to rally and perform our best. One of my favorite achievements under this family has been the addition of D’Angelico Guitars owned by GTR in New Jersey. 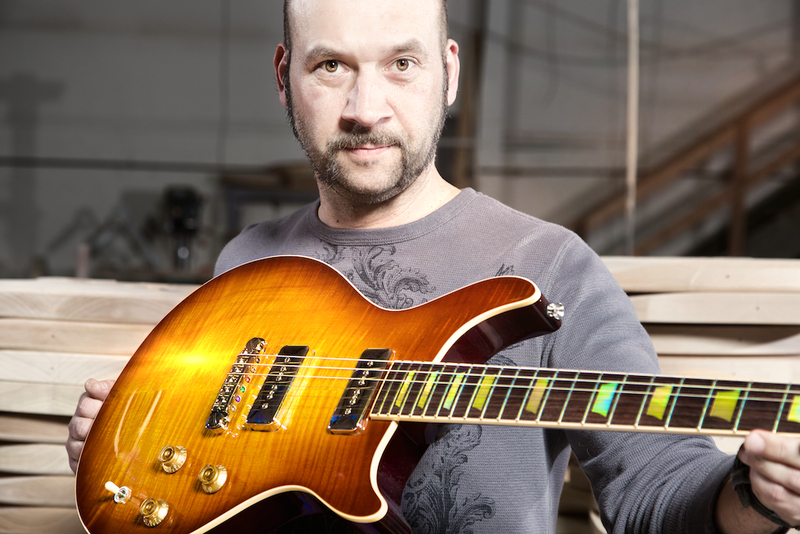 John D’Angelico is the godfather of art-deco arch-top jazz guitars. After his passing in the 1960s, the name bounced around, until GTR brought it back home. 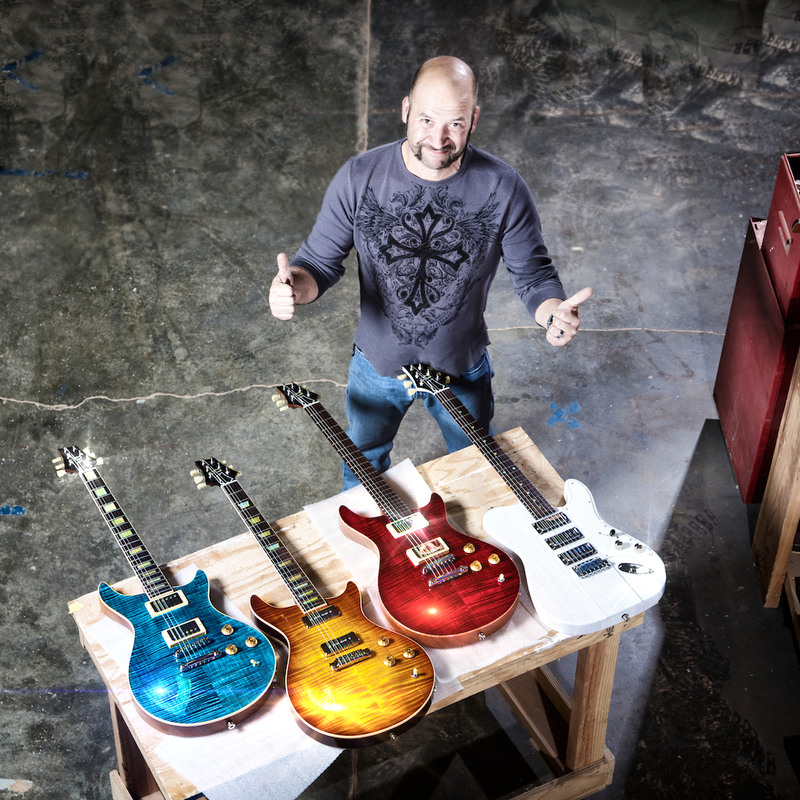 While I was employed at the Fender Custom Shop, I had the pleasure of building a lot of guitars for Sam Ash Music via Steve Pisani, who is part of the GTR family. At NAMM 2011, he approached me about a project. When he said D’Angelico, it was like this was the job I had been preparing for all my life. Ever since then, GTR submits original models to me to reverse engineer, prototype and document for production. This project also brought in another long-time friend from my Fender days, master builder Art Esparza. He called me at the perfect time, wanting to get out of the Inland Empire area of California and into the SLO life of San Luis Obispo/Pismo Beach. His wish came true, as I needed a master builder to build these D’Angelicos. He was also a builder for Steve Pisani, which made for an easy expansion. Today, we reproduce the D’Angelico USA Masterbuilt models consisting of a 1943 Excel and an Excel B Style model, and we have some pretty heavy support from players such as Eric Clapton, Joe Perry, Bernie Williams, Jonathan Butler and many more. It’s been an honor and privilege to bring these instrument back to new life for a true legacy builder. To me, this is the job and life style I have always dreamed of and have worked a life time to achieve. I’m not rich, but I’m rich in friends, family and still play as many gigs as I can book. The company is growing wisely and expanding into many countries around the globe. Fano and his Fano Alt-DeFacto line has proved to be a major hit, captivating a market, as if many vintage-based guitar companies pooled together ideas to design guitars that look as if they should have been released decades ago, which is an art form in its own right. Premier Guitar Magazine noted us as being one of the fastest growing guitar companies and received a lot of interest from their subscriber audience. Various people in the company have delegated their skills to help establish the infrastructure of the company and the departments of excellence I mentioned. My shop became the guitar production hub with my strong production background in CNC manufacturing and paint. Two-Rock Amplifiers was acquired as part of the family, which became the hub for amplifier production. Mark Bartel allocated a heavy amount of time to developing an all-inclusive order entry network server database for the entire company to communicate sales, scheduling, purchasing and accounting from any location. Today b3, Fano, Koll and D’Angelico remain as guitar brands, and Two-Rock and Tone King are our amplifier brands. Their original designers are still very much in control of the quality that we produce. Each brand focuses on a different end user, each is in their own niche of what we do best, while constantly sharing ideas as a true guild should — to expand all that we and our products are capable of. As for myself I just love gear, playing live music, camping, fishing, and I’m very thankful to be part of a team focused on quality and the evolution of guitar gear as we know it. We have had our share of naysayers that want to shoot us down, but as some people say, quality always rises to the top. Just give us some development time, and we promise to deliver some very cool guitars and amplifiers. In case you’re interested, here are some new clips from NAMM 2014.